If you can’t have fun on Capitol Hill, you’re probably lost… or you’re from Bellevue. Unlike our homogeneous neighbor east of Lake Washington, Capitol Hill is the perfect balance of diverse lifestyles. It is alternative and mainstream, post-grunge rock and new age indie, gay and straight, conservative and liberal (well, maybe a little more on the liberal side), and it is old and young, all at the same time. This trendy and edgy neighborhood is a true crossroads of lifestyles and cultures. It is where North meets South and East meets West. Built on one of Seattle’s many hills, early developers named this area Capitol Hill in hopes Washington’s Capitol would be enticed to move from Olympia. Although no one is holding their breath on that move any longer, the area has morphed into one of the more desirable neighborhoods in all Seattle. Home to some of Seattle’s old money and tree lined neighborhoods, it now offers luxury apartment living with cutting edge amenities for the upwardly mobile millennials that make up the a large portion of the new hires in the nearby hi-tech center around Amazon and the growing medical services area, dominated by Swedish Hospital and Harborview Medical Center. The eateries are abundant, diverse and out of this world. Here is just a sampling. 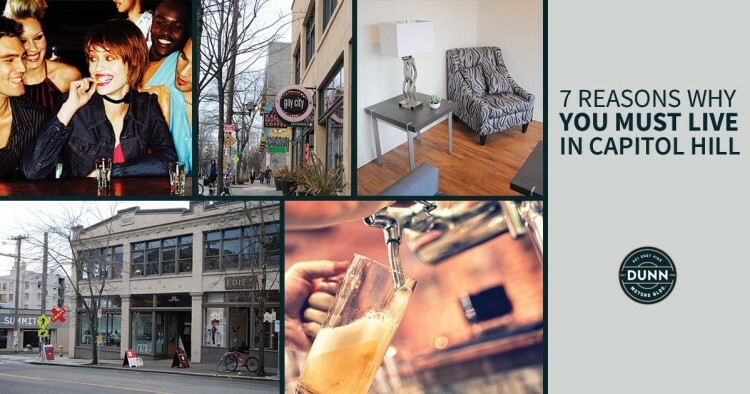 For the young, and the young at heart, step out any night and mingle with your new neighbors at any one of Capitol Hill’s top watering holes. The Q Nightclub, The Baltic Room, and Havana are musts. However, explore them all. It will take awhile. Take a stroll through some of Seattle’s most luxurious and peaceful parks. Cal Anderson Park and Volunteer Park are teeming with activity and events and are the perfect way to relax on a gorgeous sunny day. If great dining, hip taverns are not enough, street vendors and catering trucks fill the neighborhood as you meander home after indulging your social appetites and you want a little more. According to Walkscore.com, Capitol Hill is a walker’s paradise. Get rid of that car, most daily trips do not require a vehicle… sweet! The newest upscale living option in Capitol Hill, Dunn Motors Apartments, is now taking applications. Located at E. Pike and Summit Streets, this 1920s era building, for decades was one of Seattle’s largest auto showrooms and has been rebuilt into elegant apartments in this artsy, elegant and trendy neighborhood. Make sure you ask to see the views from of the many personal decks in this secured building. In addition, there is parking for both your car and your bike! Bassline Fitness is Coming to Dunn Motors!